–Paul Klee, German/Swiss artist who was highly influential in the expressionist, cubist, and surrealist movements. With the introduction of Spielgaben 8, we move from the plane to the line. 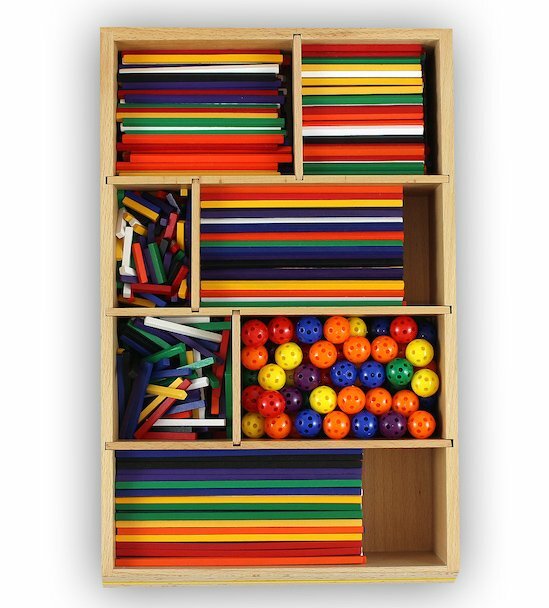 Here you will find a box filled with coloured sticks. These sticks come in 6 different lengths, which increase in size by increments of 2.5cm (1″). The sticks are numbered, based on size, from 1 to 6. By focusing on the line, children are able to create any flat object that they desire. Now, instead of being limited to a triangle with a certain angle, the child can build whatever angle he likes. New Spielgben 8 comes with vertex connection balls so children can insert the sticks into the peas (points) and create three-dimensional objects. These structures develop fine motor skills and allow the child to create models—including models of molecular structures. Start playing with new Spielgaben 8 and you’ll quickly understand how Fuller came up with the idea for the geodesic dome. With the introduction of Spielgaben 8, we move from the plane to the line (sticks). Now, instead of being limited to a triangle with a certain angle, the child can build whatever angle he likes. Let the child explore the flat sides of the sticks and explore the concept of length. These sticks are excellent for teaching measurement. Children can place multiple sticks end to end and measure their length or measure the length of a single stick and estimate how long different numbers of sticks placed end to end will be. Whereas the items in Spielgaben 2 – 6 were three-dimensional and bulkier, the items in Spielgaben 7-9 are two-dimensional. This allows children to build on a whole different level. They can still make representations of objects, but children will be more focused on creating patterns and “drawing” pictures with the wood sticks. Since the sticks are skinnier, children can also experiment with different angles and widths, creating ridges and bumps as they design.They may overlap the sticks to make even more unique patterns or see what results when one pattern is placed on top of another, making a sort of plaid or lattice design. Of course children can also simply make two-dimensional versions of the shapes they experimented with in other sets. Since they have already explored the lines and angles of the three-dimensional shapes, they should be able to easily group the sticks to create square, rectangles, and triangles, as well as new shapes such as diamonds, hexagons, and octagons. The sticks also help children begin to understand written symbols and language. Using the sticks, they can represent some of the letters of the alphabet. For example, children can make the letter A by arranging two larger sticks at an angle with a shorter stick in between. This is the same method many handwriting programs use for children to help them understand what the letters look like and how they’re formed before having them attempt to write them on their own. Another dimension is also introduced with this set of sticks – color. While children learn about colors with the balls of yarn in Spielgaben 1, they do not have an opportunity to manipulate the colors as much as they do with the sticks. Children can group the sticks by color or create patterns with alternating colors. When creating letters, children can use sticks of alternating colors to represent the different parts of the letters. For example, in the letter A, the long lines could be red and the short line could be yellow, helping kids to see the differences in the lines in the letter.